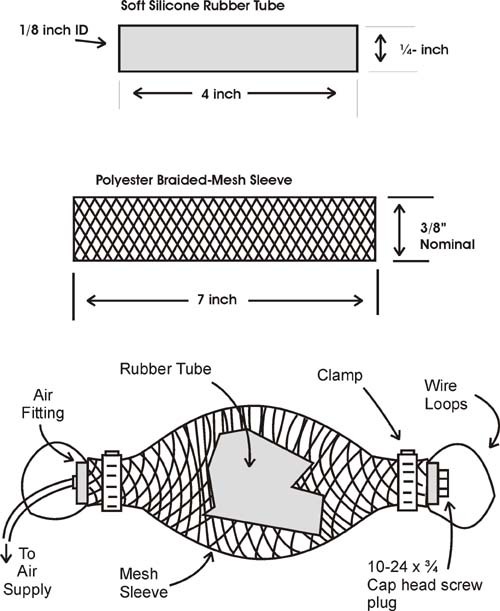 TThere are two primary components to the air muscle are a soft stretchable inner rubber tube and a braided polyester mesh sleeve, see Figure 1. The rubber tube is called an internal bladder and is positioned inside the braided mesh sleeve. All that is left to complete the air muscle picture is an air fitting on one end and two mechanical fittings (loops) on each end of the air muscle that allow one to attach the air muscle to devices. The clamps in Figure 1 are made from 24-gauge wire tightly wrapped and twisted around the ends of the air muscle. When the internal bladder is pressurized it expands and pushes against the inside of braided mesh sleeve, forcing the diameter of the braided mesh to expand. The physical characteristic of the mesh sleeve is that it contracts in proportion to the degree its diameter is forced to increase. This produces the contractive force of the air muscle. To operate properly, it is important that the air muscle be in a stretched or loaded position when it's inactive or in a resting state. If not there will little if any contraction when activated. 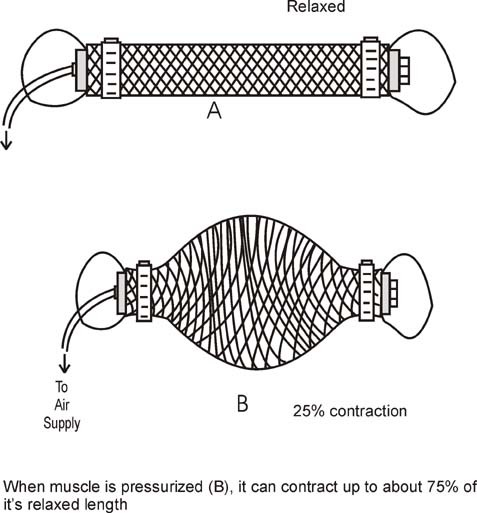 So the air muscle must be stretched in order for it to produce contraction when it is activated, see Figure 2. Typically the air muscle can contract to approximately 25 percent of its length. The illustration of the contracted air muscle in figure 2 is greatly exaggerated. When the air muscle contracts, its diameter thickens equally along it's length and contracts (shortens) as described. Air muscles typically do not develop a large bulge in the center when it is contracted, however for purposes of illustration we will shown it this way. Air muscles require a source of compressed gas (usually air). The air muscle we will build operates at approximately 50 psi. Air pressure can be generated by the easiest mean available to the experimenter including a small bicycle pump with an air pressure gauge. An inexpensive automobile tire air pump that operates using 12 VDC. Other sources are a small air tank that can be filled up at a local gas station that has an air pump for inflating automobile tires. If you use an air tank make sure it is equipped with an adjustable air pressure regulator, this will prevent pressurizing the air muscle with too much air.